It’s funny how a recipe morphs right in front of your eyes, yielding a product that you like but maybe didn’t intend. That’s how I ended up making vegetarian meatballs on Sunday morning. P.s. As you may have realized from my accounts as a foodie, I like to cook in the morning when an idea is fresh on my brain and I’m a little hungry. 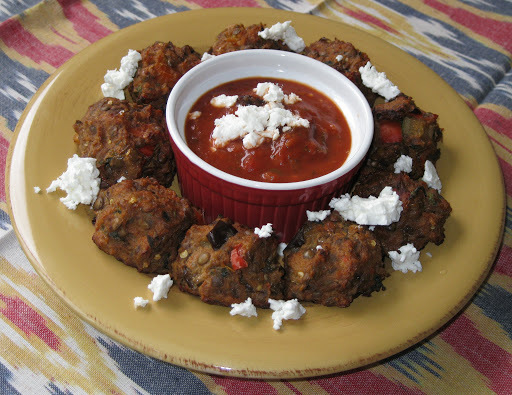 So I’ve been dreaming about pakora lately, a heavily spiced Indian vegetable fritter. It’s typically fried, which maybe adds to the delicious part, but it’s essentially potatoes, peas, carrots and a flour of some type. “Ok”, I thought, “but I don’t really want to fry it, so what if I baked it…” I was hoping to take the flavor profile down a Greek path and use up an eggplant I had lying around. 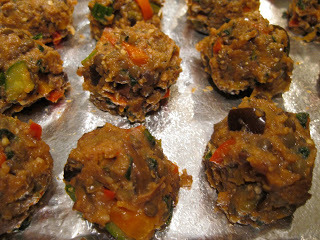 Continue the idea morphing and it ended in a moist, flavorful, everything-but-the-kitchen-sink vegetarian meatball. 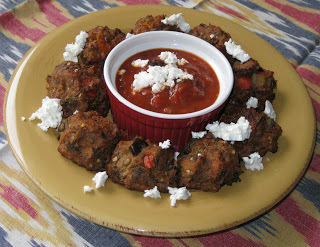 I served this with marinara sauce and feta, but later tried it with a dollop of hummus. Both were great! Now I’m slightly addicted. Make a batch of green lentils (about 1 cup dry) and keep them in the freezer. When you’re ready to make these guys, defrost, drain remaining moisture and get creative. I have a list of ideas for the next batch. 1) Cook lentils according to package. Let cool. 2) In a food processor, blend toasted walnuts until they are powdery. Set aside. Then blend onion and garlic until pureed. 3) Preheat oven to 400 degrees F. In a large skillet or dutch oven, warm olive oil over medium high heat. Add onion/garlic puree and cook until slightly browned, about 5 minutes. 4) Add tomato paste, stirring to coat mixture, about 2 minutes. 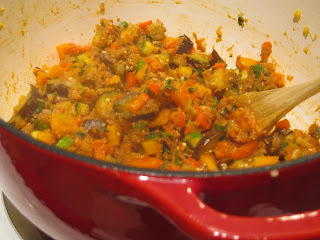 Add eggplant, carrots and mushrooms, cook about 7-10 minutes until vegetables are softened; season with 1/2 teaspoon sea salt and a few cracks of pepper. Add red pepper, zucchini, nutmeg, oregano and parsley, cook until softened, about 5 minutes; season with 1/2 teaspoon salt and 1/2 teaspoon pepper. 5) Take off heat, spoon mixture into a large bowl to cool. Taste and season with salt/pepper as needed. 6) Line two baking sheets with foil, coat with non-stick spray. 7) In a small bowl whip eggs, bread crumbs, parmesan and walnuts. Add to vegetable batter and mix. 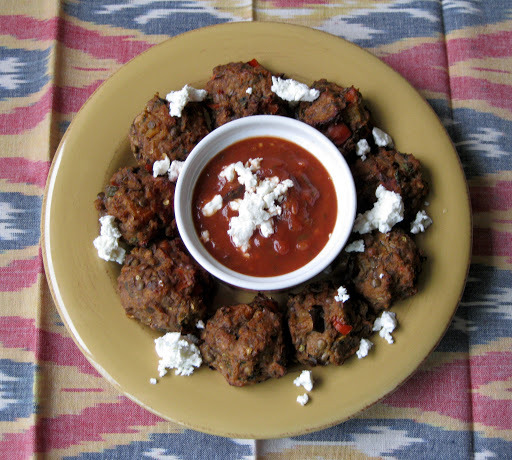 Using a spoon, scoop mixture into tablespoon sized portions (the size of a golf ball), roll balls with your hands until they feel packed together. Repeat. 8) Bake in the center of the oven for 30 minutes. Remove from oven, let cool. Gently use a spatula to remove from baking sheets, transfer to serving dish. 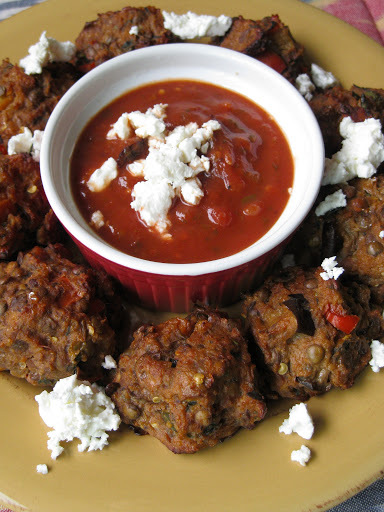 Serve with warm marinara sauce and crumbled feta.